WHAT WE OWE TO THE TREES. [p.675] THE trees are man’s best friends; but man has treated them as his worst enemies. The history of our race may be said to be the history of warfare upon the tree world. But while man has seemed to be the victor, his victories have brought upon him inevitable disasters. In the more civilized periods and places the poetic sentiment has found sweet companionship in the trees, and peopled the groves with dryads and hamadryads, while taste and refinement have planted them near the household dwelling-place, and found pleasure in their beauty and shade. The general feeling and course of action, however, have been in an opposite direction. The trees have not only been regarded by man as his lawful plunder, but he has even seemed to find a positive pleasure in their destruction. He has attached no value to them, except for the satisfaction of his physical wants, to furnish him fuel and shelter and the material of the industrial arts, and in satisfying these wants as they have arisen he has been reckless of the future. The supply has seemed to be abundant, and the future has been left to take care of itself. In our own country we have gone to the forests in a kind of freebooter style, cutting, and burning more than we could cut, acting for the most part as though all the while in a frolic or a fight, until now at length, after a century or two of this sort of work, we are waking up to the facts that our once boundless woods are disappearing, and that we are likely to suffer no little loss thereby. But it is only the few who seem now to have any adequate sense of our condition as effected by the threatened loss of the trees. In a recent publication, issued by authority of one of our Western States for the express purpose of attracting settlers from European countries, the statistics of its great lumber production are elaborately set forth, accompanied by the assurance that the present enormous consumption of trees for this purpose may be continued ten or fifteen years longer before the forests will be destroyed. The cool unconcern in regard to the future shown in this is very noticeable. “After us, the deluge.” A corresponding feeling, though working on a much smaller scale, is seen in an advertisement, and of a class often appearing in our older States. “Brace up, Young Man. You have lived on your parents long enough. Buy this farm, cut off the wood, haul it to market, get your money for it, and pay for the farm. … The owner estimates that there will be 500 cords of market wood.” And so, all over the country, on the large scale and on the small, the axe is laid at the roots of the trees, and our forests are disappearing. It is estimated that 8,000,000 acres of forest land are cleared every year, and that in the ten years previous to 1876, 12,000,000 acres were burned over simply to clear the land. So rapid was the destruction of our forests, even in the early days of our history, that in one place and another alarm was felt, and measures were taken for their preservation. In the town of Hampton, New Hampshire, for instance, we find, as early as 1639. this record : “Wood-wards chosen, and no man to fell wood (except on his own lot) without assignment of them or two of them.” Other regulations were also made for cutting and using wood. And here it may be remarked that this word wood-ward—the warden or guard of the wood—from which comes our common surname Woodward, speaks emphatically of the importance which the early settlers had been accustomed to see attached to the forests in the mother country, and which prepared them to exercise some care in the protection of those they found here. In the same town of Hampton, in 1670, there was “complaint of great abuse in spoiling the town’s timber,” the wood-ward’s power having ceased a few years before. So in the town of Yarmouth, in 1698, it was forbidden to cut timber to sell. Duxbury also, at an early day, made an order against carrying timber away from the town. Says a writer in the North American Review: “There was so much alarm in Plymouth Colony on account of scarcity of some kinds of timber that within half a century after the landing certain kinds of lumber were not allowed to be exported except conditionally.” As early as 1699 action was taken also in Brookline for the purpose of preserving the timber in that region. But in general the depredations upon the forests have gone on without restraint, and the wonder is not so much that our lumber supplies are now seen to be diminishing so fast, as that we have not been cognizant of the fact long ago, or that we have now any timber to care for. But, after all, we are only following in [p.676] this respect the course of nations which have gone before us. The nations of Europe and Asia have been as reckless in their destruction of the forests as we have been, and by that recklessness have brought upon themselves unmeasurable evils, and upon the land itself barrenness and desolation. The face of the earth in many instances has been changed, as the result of the destruction of the forests, from a condition of fertility and abundance to that of a desert. Such are the relations of the trees to the currents of the air, to temperature, to moisture, and to the soil itself, that without them the earth refuses to be a fit place for the inhabitancy of man. Never was any region of the earth better fitted by climate, soil, and natural adjustments of land and water to each other, for the abode of man in the highest state of civilization, and in the possession of the greatest power, intelligence, and happiness—in short, with the promise of the greatest and most permanent prosperity— than that which borders the Mediterranean, and which stretches through Europe from the Straits of Gibraltar on the west to ancient Phoenicia on the east, and back through Africa to the Atlantic. Here, only a little way from the cradle of our race in Western Asia, it would seem the race might have had its home and centre of power and glory while the world should last. Greece, Rome, Carthage, Egypt, in the olden time, and Spain in more recent— what nations were these! What wealth and power, what glories of literature and art, belonged to them, our marvel even at this day, and their cities the shrines which we visit from this New World, born as but yesterday, and at which we bow with reverent wonder and admiration! Ancient Italy is said to have contained nearly two hundred cities. Spain, in the time of Vespasian, according to Pliny, had three hundred and sixty. Greece was the glory of the world. Palestine was a land “flowing with milk and honey,” and crowded with cities and villages. The medals struck in commemoration of the conquest of that country, and bearing the legend Judœa Capta, bear witness, with other historical evidence, to its former fertility and populousness, the resistance which it was able to make to the Roman arms, and how important its conquest was deemed. Asia Minor, now hardly anything but a desert, an unknown region almost to us, had once, on the authority of Gibbon, five hundred populous cities. Great armies, we know, were gathered there, which poured their hostile floods over Greece. Northern Africa was the home of population and wealth. Three hundred cities acknowledged the sway of Carthage in the time of her renown, and she was able to contend with Home for the supremacy. 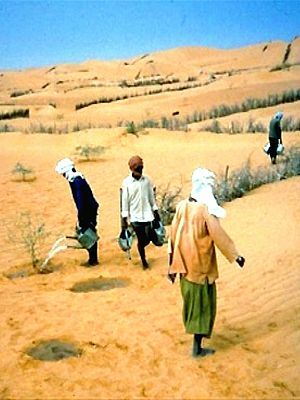 Libya was once a fertile region. She counted at one time eighty-five Christian bishops, and a population of six millions, where now are only sixty thousand. The destructive changes of which Mr. Marsh speaks so strongly have been occasioned mainly by the removal of the forests, the natural friends and protectors of man and of the earth. The harmonics of nature were thus broken up, and disturbance and destruction came as a matter of course. Undisturbed by man, the woods would maintain themselves. The tree, falling in the forest by natural decay or from any other cause, would soon have its place filled by another, and so the succession of vegetable life would be maintained from age to age. But when the trees are swept off in masses, whether by fire or by the axe, whether by an army seeking strategic advantage or the means of annoying or impoverishing an enemy, or as the result of the cupidity or carelessness of those intent upon pecuniary gain, the places thus denuded of trees often remain so. And when in any country large portions of its area are thus from any cause laid bare, it requires but a little consideration of the subject to see that such a changed condition of the surface may bring about other changes. The careful observer will see that natural causes not only produce great and even unexpected results in the field of nature, but that they are productive also of great political and moral results. Within the memory of the present generation a single article of commerce of vegetable growth, which England is obliged to import from another country, has determined her system of trade with that country, and in a measure shaped the policy of her government—has ruled the rulers themselves. Looked at in their economic character alone, the importance of the forests to any civilized country, and their bearing upon its welfare and prosperity, will be seen if we give the subject only a little attention. It is stated on reliable authority that Great Britain imports every year forest products amounting in value to one hundred million dollars. If now we add to this large sum the probable value of similar importations into our own and other commercial countries, we shall at once have some notion of the hearing which the products of the forest have upon the general welfare and comfort of mankind, and their bearing upon national prosperity. How large an element in the traffic of our own country, what an important source of industry, and therefore of thrift, to us, is its lumber product! We have no complete and trustworthy statistics of this interest. The census returns are very imperfect. A great amount of lumber in the aggregate, made in thousands of establishments on our lesser streams and away from great markets or the routes of traffic, is never reported, and no account is made of it. From particular districts and the well-known great lumber marts we get most of our facts that bear upon this subject, with which the public are somewhat familiar. It is only by putting these together, and making probable estimates from them in a general way, that we are able to come at the importance of this branch of our national industry, this source of national wealth and prosperity. The census of 1870 gives as the reported product of lumber in the United States 12,755,543 thousand feet. This does not include laths or shingles. The same census reports 63,928 establishments engaged in the manufacture of articles made entirely of wood, employing 393,383 persons, and using materials worth $309,921,403 annually, besides 109,512 establishments in which wood is an important part of the material used, as in the manufacture of carriages, furniture, sewing-machines, agricultural implements, bridges, etc., employing 700,915 persons, and using materials worth $488,530,844. The statistics of a single State—Michigan—give us for the year 1873 these remarkable figures: 3,231,470,894 feet of lumber sawed, at a valuation of $39,850,156, to which are to be added more than $4,000,000 as the value of shingles, headings, staves, hoops, etc. Such figures show us the value of the forests in connection with the traffic and various industries which occupy man, and what a serious loss to a nation in this aspect the loss of its forests must be. And then the importance of the forests as a supply of fuel, and so for the comfort of man and the prosecution of various industries, is to be considered. 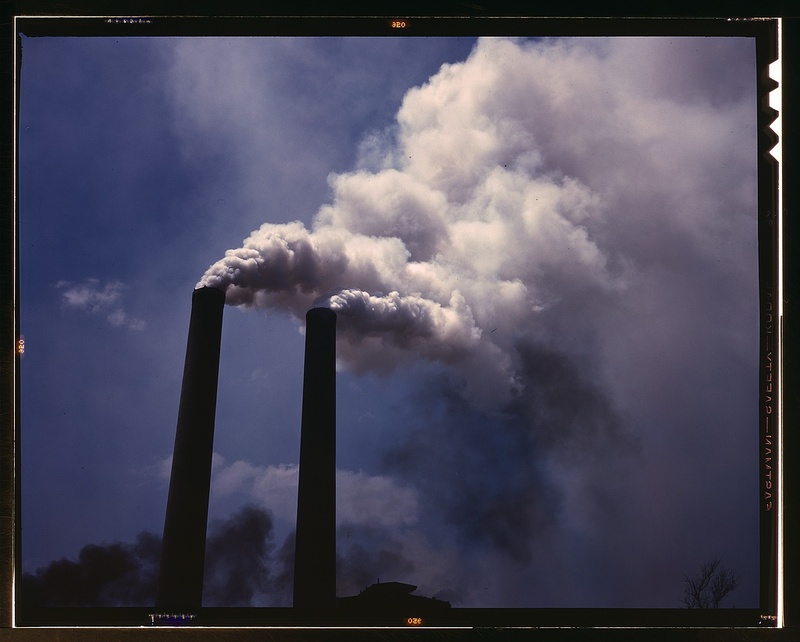 We must not forget that the coal, which is simply the surplus forests of former ages stored up and provided for our use, will some time be exhausted, and there is no more coal [p.678] to be formed. Ultimately, then, so far as we can now see, the world must go back to the forests for its fuel for the purposes of domestic warmth, and the needs of the various arts and manufactures. Already England is calculating with alarm the date, not very distant, when her coal mines will be exhausted, and her fuel must be to a great extent imported from other countries. Looked at, therefore, in this aspect of the case, we see that a country can not continue to be populous nor highly civilized when its forests, or their equivalent in coal, are lost to it. But this loss has been experienced by many nations. The whole Eastern world, as well as the countries of which we have spoken, was once well wooded. The Roman and Greek writers assure us of this. But vast regions of Europe and Asia, by wars and wantonness and imprudence, have been stripped of their forests. A belt of woodland stretching from the Pyrenees to the Himalayas has been swept away, and that whole region, once fertile and populous, now barely sustains a people scanty in numbers. It is a significant fact that great deserts now occupy the original seat of the human race, and extend on every route of their migrations. Humboldt is reported as saying: “Men in all climates seem to bring upon future generations two calamities at once—a want of fuel and a scarcity of water.” The two come alike from the destruction of the forests, as a little consideration will show. Near the close of the last century a lake in the valley of Aragua, in Venezuela, was observed to be lessening in area as the settlements in the valley and its cultivation increased. A civil war broke out in that region, which led to the neglect of agriculture, and allowed the forest vegetation again to spring up. It was observed, a quarter of a century later, that the lake was resuming its former size. So it has been observed that since the settlement of Utah, and the reclaiming of the land by the Mormons, and the growth of trees, shrubs, and glasses, the water in Great Salt Lake and other lakes around has been very much increased, and the climate perceptibly changed. Facts like these, gathered [p.679] from all parts of the world, are abundant, and would seem to leave no doubt that the forests increase the rain-fall in their immediate vicinity, and are fountains of moisture for the atmosphere and the lands about them. But the forests not only distribute moisture imperceptibly through the atmosphere around them, and thereby modify climate and affect health and agricultural industry, they are also the fountains whence issue the streams which flow down the hill-sides and along the valleys, furnishing those supplies of water so necessary for man and beast, carrying moisture through the fields and increasing their fertility, supplying power to man by which to drive all the mechanisms of industry and invention, and, as they swell into rivers, bearing on their bosoms to the ocean and to distant marts the products of a nation’s harvest fields and factories. Left to themselves, the forests would thus bless the lands continually, and be abidingly man’s best friends. It is a matter of common observation, however, that water-courses have disappeared or been greatly lessened in volume as the forests in their vicinity have been destroyed. Few persons can have grown to maturity in the open country without having had occasion to remark the disappearance of streams with which in their childhood days they were familiar. The pond or the brook where they formerly disported themselves has gone from sight, as have the neighboring woods where they rambled in search of nuts and game. This is the common experience. And as these springs and rivulets and brooks have vanished or dwindled in volume, so have the larger water-courses into which they flowed, and which they fed, been lessened in size. They have furnished diminished supplies to the farmer for the irrigation of his fields, and lessened power to the wheels of the manufacturer. We have few trustworthy and exact observations on this point in our country. In Europe they are more abundant. The river Elbe between the years 1787 and 1837 was found to have a lessened depth of ten feet, as the result of the cutting off of the forests where the tributaries of that stream have their origin. A similar result has been found in the case of the Danube, the Oder, and other streams. But an evil as important as the diminution of the streams is the irregularity of their flow, which is also the result of the removal of the forest. The fall of the leaves from year to year, and their accumulation in the forest, create there a soft, spongy soil, or humus, which catches the rain as it falls from the clouds, or the water of the dissolving snows, and instead of allowing it to flow off at once, retains it as in a great reservoir, from which it oozes away gradually through a thousand springs and rivulets, which find their way down the hill-sides and slopes into the valleys, and there unite in larger streams, which are kept in steady volume by the regular flow of the many head springs above. Thus the forests become great store-houses of power and fertility for man, upon which he can safely count in all his pursuits and occupations which are at all dependent upon the flow of water. But let the forest be swept off by the recklessness or the cupidity of man, and the first effect, besides lessening the rain-fall, is to dry up this humus, as it is exposed to the sun and the winds. As it is thus dried, it is soon carried away by both wind and rain. The spongy surface being thus removed, the falling rains have nothing to detain them. They rush at once down the hill-sides, filling the beds of brooks and rivers, overflowing the adjacent fields, and even sweeping away houses, crops, factories, bridges, and not unfrequently destroying life. In the intervals between the rains the streams are low, there being no great forest reservoirs to feed them as before. The mill-wheels can no longer turn with full force, the cattle miss their wonted springs, the crops suffer for lack of water, busy industries languish, and suffering of various kinds ensues. But even this is not all. As the flooded streams go down the hill-sides they often become torrents, scooping out the earth itself as with Titan hands, tearing up rocks and trees, and bearing them down into the valleys below to cover fertile fields with this avalanche of débris and sterility, and literally drive the husbandmen from their homes. These more serious effects of the removal of the forests we do not see very often in this country, partly because we have not yet cleared away the trees so extensively as they have in some other countries, and partly because we have a different geological structure, and fewer high mountains to produce torrents as the result of the copious rains falling at such altitudes, and the rapid melting of great [p.680] masses of snow in spring-time. We have enough, however, to illustrate the effect of the destruction of the forests in occasional floods of destructive character, and in the permanent diminution of the flow of streams. Hardly a river in our country runs with as full a stream as it formerly had. It is the common fact that our manufacturers have been compelled to place steam-engines in their factories as auxiliary to the water-power they have, or to supply the lack of it in the seasons of drought. Even when they have done this they have often also built artificial reservoirs among the bills, at great expense, to take the place of those natural ones which the forests furnished without cost. But in Europe and elsewhere in the Old World the most fearful losses from the removal of the forests are frequently incurred. Witness the flood which in 1880 desolated Szegedin, in Hungary, and that which last year took place in Spain—poor Spain, which long ago sunk in power because she had not timber enough in her wasted forests to keep alive her navy! So in France, and elsewhere along the Alps, in Germany, Austria, and Italy, they have learned by bitter experience that the trees are their best friends. In Southeastern France whole cantons have been almost depopulated. At Szegedin a population of 60,000 were overwhelmed by the waters of the Theiss. The Theiss district of Hungary is naturally one of the richest agricultural regions of the world. But it had long been known also as a region of floods. The Theiss has its sources in the Carpathian Mountains on the north. Formerly these were densely wooded, and they sent down their waters, whether rains or melting snows, into the valley of the Theiss with an even, steady flow. But the unrestrained greed and recklessness of man ravaged the forests, and opened those vast mountain flanks to sun and wind. The unimpeded waters first washed the soil of the mountains down into the stream below. Then wearing channels for themselves, they have cut these channels deeper and deeper from year to year, and as they have done so, they have torn the mountain-side with greater violence, and swept the rocks and gravel onward with resistless power for hundreds of miles. Thus the bed of the Theiss has been gradually filled up with the detritus of the upper country, until the river flows on a higher level than the adjacent land, and the inhabitants have been obliged to dike the sides of the stream as the price of their own protection from ruin. But now and then the ruin comes, as at Szegedin, by the torrents which have hurled the debris of the mountain-sides upon the fertile fields of the valleys below. In one district the population declined 5000 in five years from this cause, the people being driven from their former homes and obliged to take up their residence elsewhere. But where this has not been the result, the almost yearly recurring floods have been attended with great loss of property and the sacrifice of many lives. In a recent flood in the valley of the Garonne it was estimated that 1000 lives were lost, and a place of 30,000 inhabitants was almost blotted out of existence, while property to the amount of 300,000,000 francs was destroyed. These destructive effects of floods and torrents had been experienced in some measure for a long time. But with the more rapid clearing away of the forests, which dates from the time of the French Revolution in 1789, these evil effects had become more frequent as well as more disastrous. So far had this work of destruction and this real impoverishment of the people extended, and so threatening had become the prospect of farther and most serious national loss, that about thirty years ago the matter was taken in hand by the government, and vigorous measures adopted for the purpose of arresting the evil, if possible, and reclaiming the injured soil. Investigating commissions were appointed, and the most careful examinations were made by competent engineers and scientific experts, the result of which was the enactment of a code for reforesting the mountains. Under this code a large expenditure was authorized to be made annually by the government for a period of ten years, for the purpose of replanting those districts which had been stripped of their trees, and which had thereby given occasion to the torrents. The right of eminent domain was asserted. No one was now at liberty to remove at his pleasure the trees growing upon his own ground. He could cut them only under governmental direction, and in a way that would not be injurious to others; for it was seen that some peasant, living high up in the Alps, and desirous of extending his pasture-ground by cutting off [p.681] the forests around him, might by so doing give origin to a torrent which would carry destruction to the fields of some one miles below, perhaps to the fields of a whole village. Where the fields have been laid bare, the government offers aid to those who need it in replanting them. If any will not, with this aid, set about the work of replanting, the authorities having the work of reforesting in charge take possession of the lands and replant them. The owner has the right of redeeming his land at any time within five years after the replanting by the government has been completed, on condition of paying the cost of the labor expended, principal and interest, or by surrendering half of his land. In case this is not done, the land becomes wholly the property of the government. To do the work contemplated by the French code is by no means easy. When an Alpine torrent has rent a gap in the side of the mountain, and gone thundering down its flank for miles, gashing and 1acerating it in every direction, it becomes a case of nice and most scientific as well as skillful surgery to close the frightful wound, and restore the whole to soundness; to replace the trees, and while they are getting the growth that will enable them to discharge the office of forests, to fix such temporary barriers as will prevent the continuance of the torrential flow of the rains and melting snows. There are mechanical and vegetable laws to be studied. There are nice plans of engineering to be formed and executed. There are peculiarities of climate and many meteorological facts to be taken into account. There is also needed a careful oversight of the lands adjacent to the scene of operations, lest any ignorant or malicious person shall do something to hinder or defeat the work undertaken. So important a place have the forests come to occupy in the estimation of European people, on account of their value as sources of fuel and lumber, as well as their relations to agriculture, to climate, and to health, that the care and management of them have become one of the most important employments of private land-holders, and of the many corporate bodies, including states and kingdoms, which are the possessors of forest domains. The state forests of France, for instance, amount to 3,000,000 acres, it is said, and yield an annual revenue of $5,000,000. Many of the provinces and departments also are large forest proprietors. Germany has about 35,000,000 acres in forest, nearly one-third of which belongs to the state, one-sixth to the communes, and somewhat less than one-half to private individuals. Other European countries have larger forest areas, with correspondingly larger revenues. The recognized importance of the forest interest has led to the establishment in most European countries of what are known as schools of forestry—institutions ranking in importance with our colleges and polytechnic schools. They furnish a course of instruction from two to two and a half years in length. During these terms the pupils are expected to spend five hours daily in study, and as many more in attendance upon lectures, or to do about twice the amount of work required in our colleges. Taking for illustration the school near Berlin, the faculty embraces a director, who occupies the chair of forest science, with two assistants in the same department, a teacher of mathematics, physics, mechanics, and meteorology, one of chemistry, mineralogy, and geognosy, one of botany, one of zoology, and one of jurisprudence; and, in addition, a royal forest officer as assistant teacher of construction of roads, geodesy, and plan-drawing, and also a chemist as assistant teacher of geology. It will be seen, even from such general statements, that the instruction in these schools includes not only the technical or botanical study of forests, but embraces also a complete course in natural science and mathematics, as well as, to a considerable extent, political economy, finance, and jurisprudence. Captain Campbell Walker, chief conservator of forests in New Zealand, giving an account of his visit to the school at Neustadt-Eberswalde, says: “Nothing struck me as more remarkable than the extent and varied nature of the studies required from forest candidates or probationers in Prussia, and the number of years they are contented to spend, first in studying, and then in waiting for an appointment.” The students at these schools or academics are expected to spend several years, either before or after their graduation, in practical work in the forest, under the watch and instruction of the forest officers, and it is only after five or six years of such employment that they can reasonably expect to receive [p.682] a fixed and permanent appointment in connection with the forest service. Yet so respectable and desirable is this employment considered that it is stated on good authority that a few years ago there were not less than thirty-three barons or baronets holding appointments in the crown forests of Prussia. The important place which forestry holds abroad may be seen from the fact that there are nine of these schools in Germany, and one or more in every European country except Great Britain, which has hardly any forests to care for, while the abundant moisture from her surrounding seas, and her exemption from severe summer heats on account of her high latitude, prevent her from suffering from the absence of trees as she otherwise would. We have left ourselves space only to allude to the value of trees as shelters from injurious Winds and from malarious influences. The vicinity of a forest, or even a few rows of trees, is a great protection, not only to man and beast, but to growing crops, from violent or cold winds. Such a shelter belt often makes the difference between success and failure to the husbandman. The best observers estimate that if one-fourth of the fields devoted to agriculture were planted with trees, properly distributed, the remaining three-fourths would yield as large returns of crops as are now gathered from the whole, while the product of the trees in fuel and timber would be a clear additional gain. Trees also, aside from the fact that they absorb carbonic acid and exhale oxygen, and so promote the salubrity of the atmosphere, are found to be a very effective protection against malarious influences. The planting of only a single row of trees has produced a perceptibly favorable effect, while belts of trees planted in the vicinity of pestilential marshes have rendered them no longer noxious to those living near them. It is pretty well settled now that for the best interests of most countries, their healthfulness, the greatest productiveness of their fields, and their general comfort and thrift, not less than a fourth part of their area should be permanently in forest. Wherever this proportion is not preserved, harmful consequences sooner or later ensue. But in Europe the forests are cherished and cared for not only on this account, but as being one of the most important industrial resources of a country. Science and art are employed not only to preserve a proper amount of woodland for the best development of other interests, sanitary and economic, but to produce the largest pecuniary returns from the forests themselves. The conditions for the best growth of the forest as a direct source of income are studied as carefully as are those for the growth of wheat or corn. By constant experiment and observation, in connection with the schools of forestry, it is ascertained what trees are best adapted to grow in particular soils or with particular exposures, which flourish best in a moist and which in a dry atmosphere, which in elevated and which in low situations. It is found, also, that trees, like human beings, are not only social in their nature, and will grow better when planted together in masses than when obliged to grow singly and apart from each other, but that they like a varied society; that the pine, for instance, will flourish better, will develop its nature more fully, attain a grander stature and a better quality, when planted in company with the oak or other trees different in character from itself, than when it is limited to the companionship of its own kind. The same is true of other trees, and it is only as the result of a nice and protracted study that the affinities of trees or their preferences in this respect can be determined. Then, also, it has been found that trees come to their best when a rotation of crops is observed, as in the case of the grains and grasses, and so the officers in charge of the governmental and other forests have it for one of their duties to determine what classes of trees shall succeed each other, and in what order. Under this forestry management, now so well established in every country of Europe, the woodlands or forests have as constant oversight and care as the corn field has with us. The forest is not, as here, a hap-hazard and accidental growth. with which man has little to do except to notice its progress, and levy upon its resources according as they may serve his convenience or his greed, but the trees are regarded as one of the staple crops of the land. They are planted for a definite end—fuel or timber—but so planted as to conserve all other interests of the community. This planting is prepared for with due reference to the fact that the crop is not to be gathered at the end of a few months, but only at the expiration of a [p.683] century or more. From the sprouting of the pine seed or the acorn in the seed bed until it has attained its growth and come to its destined harvest-time, a hundred and twenty years it may be afterward, not a year passes—we might almost say not a day—when it is not looked after with care, and everything done which will promote its best growth. What shrubs or trees shall be planted near it to protect its infant feebleness, how near it they shall be planted, how soon one and another shall be removed in order to give it more light and more room in which to develop itself, what insects are preying upon it and threatening to check its growth, what symptoms of feebleness are manifest, and what may be done for their removal—these and many other things are taken into consideration; and the tree is thus watched over not by one person, but by many, and by generation after generation whom it outlives. Then, again, if a piece of forest is planted with a view to a yield of fuel, it will have a different treatment from that which will be given it if it is designed to produce timber or lumber for use in the constructive arts. The most economical method of cutting the trees when arrived at maturity, and the best means of getting them to market, whether by land or water carriage, will also be carefully studied. Roads will be constructed by the most scientific engineering, and canals will be made, or river-courses will be taken advantage of, and by means of dams slack-water navigation will be obtained for the purpose of facilitating the movement of the products of the forest. Then, furthermore, the forests will be carefully guarded against all browsing animals, which the experience (if European foresters has proved are among the most destructive agencies against which they have to contend. It has been well said by Sir John Sinclair, in his Code of Agriculture, that “a landlord had better admit his cattle into his wheat field than among his under-wood. In the one case they only injure the crop of one year, whereas in the other, by biting and mangling one year’s shoots, mischief is done to the amount of at least three years’ growth.” Oftentimes the death of the tree ensues. In some European countries the right of pasturage, which has been entailed upon many of the forests, has been one of the greatest burdens which the proprietors of woodland have had to bear. A similar right to gather the fallen leaves, for litter or bedding, the Streu-recht, which attaches to some forests, is considered a great hinderance to the growth of the trees by taking away their natural constituents, and the proprietors have taken great pains to extinguish such rights, by purchase or otherwise, whenever it has been possible to do so. Of forestry as an art or science we know very little in this country. Even the word is new to us. With our almost unlimited domain, the single State of Texas exceeding in area some of the larger kingdoms of Europe, we have had little thought of there being any need of care for our forests. Now and then attention has been turned to the need of preserving our ship timber, and to the fact that our pine woods are being consumed very rapidly in some portions of the country, and that this is threatening us with a scarcity of desirable lumber, and high prices for it in the near future. But we have refused to take alarm, or use measures to prevent the impending evil. The belief seems almost to be born with every American that his country is the greatest in the world, and its supplies of every kind inexhaustible. Prophets of danger are not listened to. We give ear to those only who prophesy “smooth things.” More recently, however, the subject has been forcing itself upon our notice. The history of the destruction of forests in the Old World, and the disastrous effects which have followed, the facts which we have already cited, have engaged the attention of observing men among us. One and another have written more or less largely upon the subject. The work of Mr. George P. Marsh entitled Man and Nature, which is received as an authority in Europe, where the literature of forestry forms a considerable library of itself, and includes the works of some of the most scientific and nicest observers in the world,* presented the [p.684] subject to many in a new and very interesting light. Some efforts have been made within the last few years to secure Congressional action for the protection of what forests yet remain in the public possession. As the result of a memorial from the American Association for the Advancement of Science in 1876, the Commissioner of Agriculture was directed to appoint some competent person to inquire and report concerning our forest products, the means of preserving and renewing forests, the effects of forests upon climate, and the methods that have been adopted in other countries with success in the management of them. The report made under this appointment has been recently published in part, and embodies a great amount of information upon the subject of which it treats. It is to be hoped that the unpublished part of the report will soon appear. But it shows the general unconcern in relation to the matter that the Secretary of the Interior, who, with an intelligent knowledge of the importance of the subject, and a familiarity with the European methods of treatment, would be glad to take efficient measures for the preservation of the national forests, is unable to procure from Congress the appropriations necessary for the prosecution of those who commit depredations upon the timber lands belonging to the government, and who are threatening them with irreparable injury. Ignore the matter as we may, shut our eyes to facts as we please, we are rapidly approaching the condition of things in Europe which has called for the interposition of governmental authority for the preservation of the very soil itself from hopeless barrenness, and to protect great national industries from permanent injury. While in some portions of our country there is still an ample supply of forest, the latest statistics show that in the proportion of forest area to the entire surface this country stands below Norway, Sweden, Russia, and Germany. A great treeless belt from three hundred and fifty to eight hundred miles in width stretches from the Gulf of Mexico to the Arctic Ocean. Sometimes this is absolutely destitute of trees as far as the eye can see. Elsewhere there are fringes of trees along the river-courses. The heavily timbered Black Hills stand out like an island in the midst of an ocean. Other similar detached forests are occasionally found. Beyond the Rocky Mountains, again, there is another treeless region, extending from the Columbia River to Mexico, and Professor Brewer says it is possible to cross the continent from the Pacific to the Gulf of Mexico without passing through a forest five miles in extent. Persons who have traversed our newer Western States, almost all of which are deficient in forests, report the destruction of even those limited supplies of timber by fire as being sad to behold. 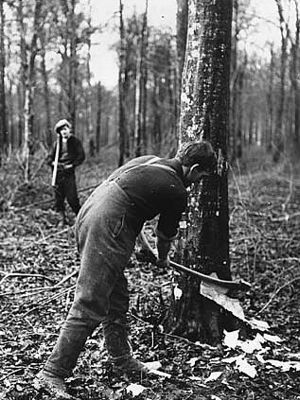 The miners consume great quantities of timber in the prosecution of their work; but so reckless are many of the settlers and traders in the destruction of the trees that self-interest has prompted the miners in some cases to establish a system of lynch law for the protection of the forests. One saw-mill on the Keweah cut over two million feet of “big-tree” lumber in one season. But in these milling operations waste far exceeds use; for after the choice young manageable trees on any given spot have been felled, the woods are fired to clear the ground of limbs and refuse, with reference to further operations, and of course most of the seedlings and saplings are destroyed. In the Rocky Mountain region hundreds of square miles are disfigured by the trunks of trees blackened by fire. Where one tree is cut for use, ten probably are consumed by the flames. Professor Hayden, in his report of 1871, in speaking of this subject, calls attention to the fact that these burned districts are not covered again by a subsequent growth of trees, but remain bare for evermore. He intimates also that there is reason to believe that in that mountain region, even when undisturbed by the hand of man, the forests are gradually disappearing under the influence of natural causes. In the same strain, a writer in the Virginia Enterprise, Nevada, says: “It will be but a very short time before we shall be able to observe the effect that stripping the fine forests from the sides and summit of the Sierras will have on the climate of this State and California. In a very few years every accessible tree, even to such as are only of value as firewood, will be swept from the mountains. Even now this has been done in some [p.685] places. It is to be hoped that a new growth of pines or timber trees of some kind may spring up on the ground that has been cleared, but we do not hear that any such growth has yet started.” The president of the State Board of Agriculture of California reported ten years ago that within twenty years at least a third of the whole native supply of accessible timber had been cut off or destroyed, and that, judging the future by the past, it would require only about forty years to exhaust the remainder. He says: “Thousands upon thousands of the noblest and most valuable of our forest trees in the Sierra Nevada districts have been destroyed without scarcely an object or a purpose, certainly with no adequate benefit to the destroyer or to any one else.” Reports like these might be multiplied to almost any extent, and it is only when we bring such reports together that we are able to get a proper notion of the work of sylvan destruction that is going on, and which is threatening us with such danger —danger not only of a scarcity of lumber and fire-wood, and the enhancement of the cost of a multitude of articles of comfort and convenience, but danger of a deterioration of climate, carrying with it a diminished productiveness of our fields, and influences detrimental to health. This danger can hardly be overstated, nor can we be too prompt or energetic in our efforts to avert it. It is encouraging to see the signs of awakening interest in this subject which are appearing in various parts of the country. The very necessities of their situation have aroused the people of some of our Western States to action. In Kansas, Nebraska, and other States liberal premiums have been offered for the encouragement of tree-planting, and already in many portions of the prairie region a perceptible change has taken place, and the eye no longer wanders over great spaces without sight of shrub or tree. Minnesota has her Forestry Association, and its secretary reports that between seven and ten millions of trees were planted in that State during the year 1877, of which more than half a million were planted in a single day, “Arbor Day,” as it is called, or tree-planting day, the first Tuesday of May having been fixed upon as the day, and every owner of land invited to devote the day especially to the planting of trees. Similar efforts have been made in other States which are similarly situated in respect to a supply of forest. The great railway companies, whose roads stretch across the treeless prairies, have become in some instances large planters of trees, feeling the need of them both as screens from the fierce storms that sweep down from the Rocky Mountains, and as a source of supply for the ties which are constantly needing renewal. Tree-planters’ manuals are published and distributed freely, with a view to aid those who would plant by giving them the experience already obtained in regard to the most profitable trees to plant and the best methods of planting. Thus in some places there is already quite a movement in the right direction. In the reports of planting, the figures make an imposing aggregate. But a liberal discount needs to be made for the probable failure of a large percentage of the trees planted. And even with the most generous estimate in regard to the work of planting, what is accomplished as yet is but a fraction of what needs to be done. It is but the feeble beginning of a vast work. The talk is of millions of trees planted. This sounds well. But a good many trees can stand upon an acre, and the latest estimates put the annual decrease of our forest area at seven million acres. So that Minnesota, with all her ardor in this work. has only planted one tree for every acre of trees destroyed. An area equal to that of the State of Maryland is every year swept clean of its trees. This is a large section to be taken yearly out of our forest resources. With all that we are yet doing in the way of tree-planting, the balance is largely against us. With all the interest and energy manifested by the young West on this subject, stimulated by her most pressing need, we are only planting one acre while thirty-five are laid bare by the axe and by fire. And we must consider also that the work of destruction goes on at an increasing rate from year to year as our population and our industries increase, and that the trees which are felled are the product, on the average, of more than a century’s growth, while those we plant must grow during a century before they can fill their place. The work before us, therefore, is but just begun. With the utmost that we are likely to do, or can do now, we shall inevitably suffer more than we yet have done before the evils of our present condition can be remedied. Our streams [p.686] will flow with still less volume than they now do. Floods and droughts more distressing and destructive than those which have marked the last twenty-five years will yet make us their victims. Tornadoes and sweeping blasts, coming over vast regions where their course is unimpeded by the friendly and protecting trees, will be the scourges still of man and beast. Nature bears long with those who wrong her. She is patient under abuse. But when abuse has gone too far, when the time of reckoning finally comes, she is equally slow to be appeased and to turn away her wrath. We must hear her resentments for a time, do what we will. But if we are ready to take lessons from the nations that have gone before us, we may escape most of the bitter sufferings which have been their lot. We can do that which will put a period to the evil results of our own misconduct. For this purpose the most important and fruitful thing to be done is to spread the facts relating to the subject before the people as widely as possible, that common conviction and common feeling may insure appropriate and harmonious action. The mass of the people need to be enlightened in regard to the relation of the trees to water supply, to agriculture, to health—in short, to all the varied life and interests of man. They should have set before them the warnings from the history of the Old World. They need, too, all the facts relating to the growth of trees as related to the peculiar conditions of surface, soil, and climate in this country. The problem before us is not to be solved simply by the methods which have been successful elsewhere. There are peculiar elements which call for peculiar treatment. As to facts, also, they are yet in large measure to be discovered by patient observation and experiment. There are a great many so-called facts in regard to this subject, as there are in regard to most subjects. What we especially need are facts which are facts—facts established, not by one individual working in a limited range of circumstances, but facts based on a wide induction from the work of concurrent and competent observers. We have been experimenting, and have ascertained some facts. Let these be spread before the people, and be used so far as they may be used wisely. Meanwhile the call is for more of careful, patient, scientific observation and experiment. We want to know what trees will grow best in one soil, and what in a different one; what in one exposure, and what in another; which will make a screen or wind-break soonest and best; what trees are most profitable for fuel in Kansas, and what in Massachusetts; and what are most profitable to be grown for timber or for the arts. We really know very little as yet about many of these questions, and knowledge is what we want here, of all things. If a man in planting for a crop of corn makes a mistake in choosing his seed or soil, or in his method of cultivation, it is not very serious, and he may correct it the next year. But if one makes a mistake in planting a forest, he incurs a loss not only for one year, but for fifty or a hundred in succession. The mistake is not to be corrected perhaps for a century. What we want, then, as one of the first and most effective helps in this matter, is something in the nature of the experiment stations so common in Europe, and known to some extent in this country, and more or less closely connected with our agricultural societies, in which careful experiments are tried in regard to seeds and soils, their mutual adaptations, the best methods of tillage, the composition and comparative value of fertilizers, the breeding of domestic animals, and so forth. So we want something of this kind where the observations and experiments shall relate not to the annual crops of the farmer, but shall take in the larger growths of the forest, studying all that relates to tree growth, and carefully recording all ascertained facts, testing the value of different woods for various purposes, investigating the relations of the forest to moisture and rain-fall, to water supply and climate, and so to health—in short, the relation of the trees to the world in which man lives, and to his life in it. No one station could do the needed work for a country extending as ours does through so many lines of latitude and longitude, and embracing such a diversity of meteorological conditions. There might well be a station in every State, and our agricultural colleges and societies could in no way better prove themselves true to the name they bear than by undertaking such a work of careful observation and experiment as we have indicated. First, a museum of living plants, in which every tree and shrub capable of withstanding the climate of Massachusetts is to find its appropriate place, this collection being supplemented by a herbarium and various special collections illustrative of trees, their products and uses. Second, a scientific station for investigation into the character, growth, and economic and ornamental properties of trees; into the relations of forests to climate and the flow of rivers; and into the best methods of forest reproduction and management. Third, a school of forestry and arboriculture, in which special students may, when the demand for such instruction is felt, acquire the knowledge and training necessary to fit them for the care and increase of our forests. This modest institution has already modified legislation in favor of tree-planting in several States, and been the direct cause of planting many million trees. It is doing a great deal in introducing and testing new plants in this country, and sending those of this country to different parts of the world. It maintains an extensive correspondence in regard to trees and arboriculture with every part of the United States and Europe, and is doing much in collecting and disseminating information in regard to trees and their culture. A similar and unmistakably good work may be done in connection with any of our colleges or scientific schools, and there is hardly an object which more commends itself to the liberal-minded lover of his country than the founding of such institutions as the Arnold Arboretum. How far the general or State governments should be looked to for aid in protecting the existing forests, or in planting where there are none, is a question which will be answered differently by different persons. The magnitude of the interests concerned is such, and their relation to the welfare of the country so direct and important, that, in itself considered, the legislative power might be unhesitatingly invoked. But it is not the policy of the State or national governments to be the owners and managers of great tracts of land, like the European governments. Besides, there would be great danger of mismanagement if the governmental authority were directly engaged. But so long as the nation or the separate States are holders of public lands, they may well be expected to protect them from wanton destruction. And it is a sad indication of our ignorance of the true value of the trees, and our consequent indifference, that there should have been any hesitation on the part of Congress to protect by all its power the timber lands of the West, scanty in amount at the best, from the thieves and marauders who are threatening by their course to convert vast tracts of land into a desert, and bring upon that portion of our country irreparable evils. The national government has done something in the right direction by the passage of an act, a few years ago, by which the public lands were made an outright gift to the settler on condition of his planting a certain portion of it with trees, and cultivating them for a definite period. It has been thought by some that a Bureau of Forestry might be established in connection with the Department of the Interior, to which might be committed the care of the so-called “timber lands” belonging to the government, and of the great parks of the Rocky Mountain region, and which might do good service in collecting facts relating to the growth and uses of trees, and disseminating them throughout the country. Others fear the strong tendency of all bureaus in our country to fall into the hands of mere politicians, and so to fail of accomplishing any good. Possibly the end desired may be attained in connection with the Smithsonian Institution, aided as occasion may demand by Congressional co-operation. Possibly there may grow up by-and-by in this way a central national arboretum, in addition to those established as we have suggested in the several States, and perhaps a School of Forestry, or something answering the purpose of such. But for the present it would seem best to rely upon what may be done Within the narrower circle of State action, whether it be of the local governments or of voluntary societies and scientific associations. These organizations will be comparatively safe from political influence, while they will be likely to be the more effective as they are closer to the various theatres of action, and will understand more fully the special needs of their particular localities. * The large place which forestry holds in European countries is strikingly shown to the American mind by the number of publications on the subject issued from the European press. Spain, from which we should not expect a voluminous literature of the sort, furnishes us a catalogue raisonné of 1126 books, MSS., etc., in Spanish, on subjects connected with forest science. In Schmidt’s Catalogue, published in Prague in 1876, are given the titles of German works on this subject published from 1870 to 1875 inclusive, which amount to 650. A gentleman to whom application was made from the Cape, South Africa, for information in regard to suitable works on forestry in the German language, reported that they might be reckoned by cart-loads. Publications on this subject are also abundant in the French and other languages of Europe.